Gargi Enterprises - Manufacturer of Plastic Moulded Components - Bangalore - India. Gargi Enterprises was established in the year 1982 by G. V. Nagesh. The company is based in Bengaluru, India and is into manufacturing of Industrial Plastics injection moulded and Metal Pressed Components. With the efforts of all company employees, the company has successfully delivered solutions to satisfied customers in India and abroad and is now a name to reckon with in the areas of industrial plastics injection moulded and metal pressed components. Leading public sectors, 100% EOU Companies situated in special economic zones. Companies in Italy, Australia and Singapore. 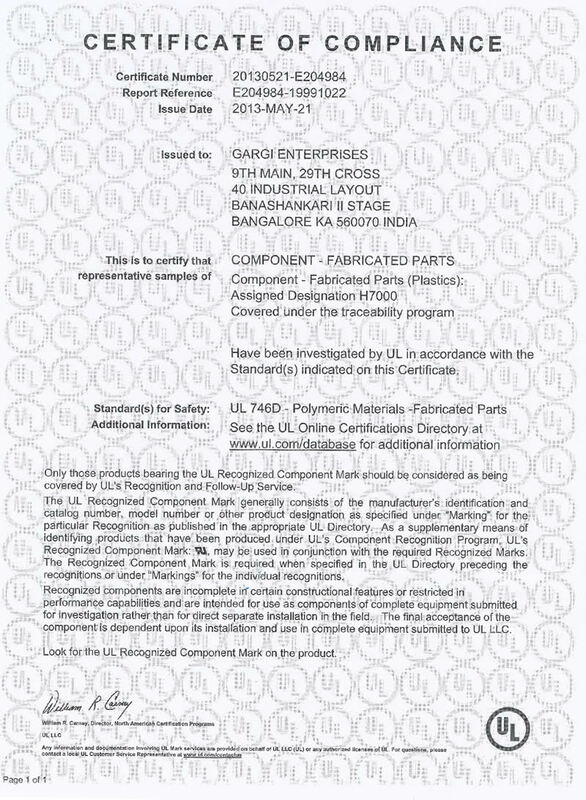 We have adopted DIN EN ISO 9001 : 2008 system and the same is certified by TUV NORD Certification body. Website Powered by Surfzone Technologies.